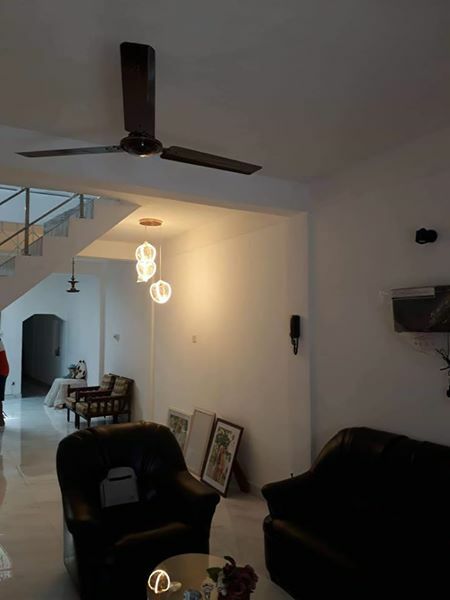 A newly refurbished fully tiled house located in rajagiriya located 800 meters from the Cotta Rd, along the Obesekarapura Road. Has 20 Feet motorable access to the doorstep. Short drive to Borella, Rajagiriya, Nawala, Nugegoda, Kotte and Battaramulla. Other places such as Malabe, Kaduwela, Kolonnawa and Awissawella Low Level Road through Hanwella are within accessible proximities. Land Extent :- 5 Perches. 4 Air-conditioned Bedrooms with TV & Intercom connection. 2 Common Bathrooms with Hot / Cold facility, Fan, Intercom connection & TV. Spacious Living and Dining areas facilitated with a Television & Intercom connection. Pantry is also equipped with Intercom connection & TV. TV Lounge on the 1st Floor. Maids’ toilet & a Courtyard on the Ground Floor. • Secure car porch with Roller shutter & Wicket gate. • House is secured by 3 CCTV surveillance cameras with a 8 port DVR. • Sensor lights cover the Outside, Courtyard, Master BR Balcony and Roof Terrace. • Electricity & Pipe borne water with an overhead tank (1000 liters). • SLT Connection with CLI Phone. • Large roof terrace can facilitate parties & gatherings. • Clear title documents available for Banking facilities.